One of the things I get asked when people have read Sixty-One Nails is; where did I get the idea for the Quit Rents Ceremony from? The short answer to that is, I didn’t make it up. I found it. Back when I was developing the novel, I was researching English folk-lore to incorporate into the story. I had already decided that The Courts of the Feyre could be a series and I wanted the world to be consistent and realistic. Moreover, I had decided that it would be set in the real world and the present day. Little did I realise then how difficult that would be, but that’s another story. In my researches I came across a number of strong themes. Fertility and children appeared again and again and the concept of a changeling, a fey child, being swapped for your own sweet babe. The performance of some service, by magical or mundane means, was another. The idea that you could ‘lose’ time traveling between places and that some places ran in different time-frames than others was also there. All of these are incorporated into the background of The Courts of the Feyre. Inventing such strong and powerful creatures to live alongside humanity creates a whole new set of problems for the writer. The obvious question is; where are they? If there is another race of strongly magical creatures that are like humans but not human then where is the fossil record? Why don’t we see them? Why don’t we know about them. My answer to that question is that we do know about them. They are described in some detail in records handed down from generation to generation, in a verbal tradition spanning thousands of years. The record confirms that our relationship with these creatures is not always antagonistic and that they have their own problems and issues to deal with. Of course, this verbal archive has been modified and embellished over the years and at times radically altered – by the Victorians, for instance, who created the tiny creatures with flower petal hats and mushroom houses, but the core themes of these stories remain uncorrupted, and some of the oldest stories remain. One of the elements that remains unaltered is the antithesis between magic and iron. The remnants of this can be seen in wedding ceremonies where little silver horse shoes are added to congratulatory cards and tin cans are tied to wedding cars. Of course, originally these would have been real horse shoes and the tin cans would have been ironmongery. Indeed, in some parts of the country, the bride and groom are still required to leap over an anvil to seal the match, proving that they are both who and what they appear to be. Research into horse-shoes brought me to accounts of the oldest legal ceremony in England apart from the coronation itself. In the Quit Rents Ceremony, six horse shoes are presented to the Queen’s Remembrancer, the official of the Court of the Exchequer, along with sixty-one nails (hence the title of the book) as a rent for permission to have a forge in Tweezers Alley, in the parish of St Clement’s Dane. This was granted by King Henry II and first entered into the rolls of the Exchequer in 1235. Quit Rents are a medieval mechanism brought in to allow someone to go quit of an obligation (to raise a levee of men to fight in an army, for instance) and to substitute some other goods or service for the obligation. When this particular rent is first recorded, a man named Walter le Brun, probably a Norman Knight, had gained permission to have a forge in the corner of a field of the grounds used by the Knights Templar, now called Middle Temple. This probably gained the name Tweezers Alley after the tweezers used by smiths to heat items in the forge that stood there. As a quit rent, this would not be so remarkable, since all of London ran on horse-power up to the twentieth century and horse-shoes and nails were valued items, carefully crafted. In 1237, it was commuted by Emma of Tewkesbury from eighteen pennies to six horse-shoes and sixty-one nails, which may have been commensurate with the value of the original rent. What is unusual is that the same horse-shoes and the same nails are used every year, making these the oldest horse-shoes in existence in England. The shoes themselves are massive. much bigger and heavier than a modern shoe and flat in design. They were meant for a Flemmish warhorse, a breed that has since died out, but would have been larger and heavier than a modern shire horse. Each shoe is holed for ten nails rather than the usual seven. Sixty 0f the nails are identical, held in bunches of ten by green ribbons and counted out before the Queen’s Remembrancer during the ceremony. The extra nail, the sixty-first, is subtly different from the others, discounting the theory that it is provided merely as a spare. In a normal quit rent the horse-shoes and nails would have to be made each year and presented accordingly, but in this case they are not. Furthermore, the rent is rendered by the City of London, who acquired the obligation at some point, but the forge is not in the city, residing in the parish of St Clement’s Dane, just south of the Strand and therefore in the city of Westminster. For me, this chimed with the research I was doing into folk-lore and inspired the book that became Sixty-One Nails. In tomorrow’s post I will describe the 2009 ceremony as it was conducted yesterday, in the Royal Courts of Justice. One of the oldest and most pervasive images in folklore is the Cottage in the Woods. Whether that cottage is where Grandma lives when Little Red Riding Hood comes to call or whether it is older and darker and might suddenly sprout chicken legs and walk about, the iconic image runs like a thread through our traditional story-telling. As part of my series on the background and inspiration for Sixty-One Nails, I wanted to show you the house where Blackbird grew up. To understand what occurs here and how it is significant to the story you will have to read the book – no spoilers here – but I think you’ll agree, it’s definitely a place where something happens. 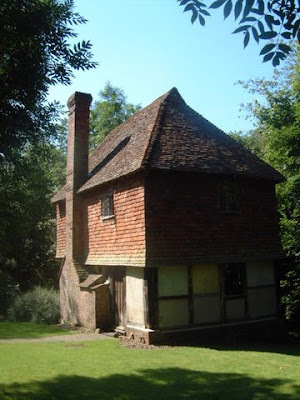 So this is the inspiration for Blackbird’s house, and its real name is Hole Cottage. 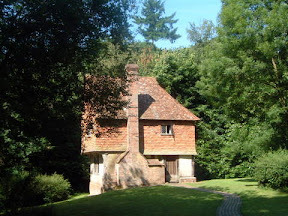 It is owned and managed by the Landmark Trust and although it is a cottage now, it was originally part of a late-medieval hall-house, the rest of which was demolished in 1833. To reach Hole Cottage, you have to find the gate off the road, and drive past some buildings and then enter the woods. The track under the trees is deeply rutted and quite muddy – this place never quite dries out. The track winds through the trunks until you come to the end and you have to walk the rest of the way. You are immediately rewarded, though, as you come into the clearing and there’s the house, just like the picture. There is a lingering smell of old wood-smoke and the chitter and call of magpies. As you stand and watch, you cannot help but feel that you too are being watched. Maybe it’s the rabbits, scuttling into the forest margins or maybe the cottage itself wants to see who has come to stay. We stayed here for a few days and it is a truly beautiful spot. The sense of isolation is quite profound and the only encroachment of civilisation is the occasional jet in a holding pattern for Gatwick which, while not far away, would seem to belong to another age. It is not for the faint hearted, though. The heating is provided by a log fire and the surrounding trees mean that it rarely gets full sun to warm the bricks through. In the accounts of past visitors there are log entries which describe going to bed in socks and woolly hat and then drawing lots to see who will rise first to light the fire on winter mornings. Thankfully we were there in summer, though we still lit a fire each afternoon as the sun dipped below the trees. A stream runs along the back of the house, and the sound of the breeze in the leaves means that while peaceful, the cottage is never silent. You are quite likely to be startled by a scuffling mouse or, when opening the door, disturb the rabbits grazing the lawn. The surrounding forest is old woodland, dense until you break through under the canopy and then tangled with old briar and nettles. Come at the right time of year and you will find sheltering bluebells. There are pathways through to meadows with sheep that watch from the shade of great oaks and chestnuts. As you meander back to the cottage and come into the clearing there is a feeling of returning to a time rather than a place, and that if you hurried, you might catch sight of a larger house, perhaps as it was originally. And then there’s a faint smell.